Men play at tragedy because they do not believe in the reality of the tragedy which is actually being staged in the civilized world. The first snowstorm of the year has engulfed Duluth, and I have rather fittingly spent my snow day re-reading Jon Krakauer’s Into Thin Air, a bestselling account of a 1996 disaster on Mount Everest. Krakauer, a longtime outdoors writer with a thing for prepositional phrases (Into Thin Air, Into the Wild, Under the Banner of Heaven), was sent to Nepal by Outside magazine to do a piece on the increased commercialization of mountain climbing. It was also a chance for a longtime mountain climber to pursue a life goal, and while he had no Himalayan mountaineering experience prior to his trip, he was clearly one of the strongest client climbers on the mountain that year, being the first to summit on May 10, despite having to wait for and pass countless slower climbers along the way. His piece, however, took an entirely different turn when tragedy struck that day, leading to the deaths of eight mountain climbers. Of course, Krakauer’s apparent prowess despite his lack of experience points to one of the key issues with the 1996 climbing season: many of the climbers on Everest that year had little business being there. His book centers around two private companies, Adventure Consultants and Mountain Madness, each comprising of three guides and eight client climbers. The clients had some experience, but only one was a real mountaineering champion; most were wealthy doctors with a climbing hobby. The Mountain Madness expedition included Sandy Hill Pittman, a New York socialite and journalist who had Sherpas haul luxuries into base camp and a satellite phone most of the way up the mountain. After the book came out, she was brutally caricatured and ridiculed, but it’s hard not to diagnose naïveté in a woman who set out on a journey known to pose great risks as if it were a sightseeing tour in the Appalachians. And, all in all, those two firms were better than many of the others. The lead guides, Rob Hall of Adventure Consultants and Scott Fischer of Mountain Madness, were very experienced climbers who had made an art of helping inexperienced climbers up Everest. Many of their fellow expeditions could claim no such expertise. The Montenegrins who attempted to summit the day before were supposed to lay down rope on some of the highest reaches of the mountain, but wasted all their rope on relatively easy stretches. An incompetent Taiwanese leader shrugged off the death of a member of his party the day before and tried to soldier up the mountain on the same day as the two firms, adding to the bottleneck and later needing to be rescued by Sherpas from the Mountain Madness team. And then there was the South African expedition, led by a complete con man who tried to profit off of a post-Apartheid reconciliation scheme; he refused to loan out his satellite phone as people died on the mountain, and a member of his expedition died a few weeks later, on the day he successfully summited. On the Tibetan side of the mountain, a Japanese party climbing the subsequent day ignored three half-dead Indians, with one of their number claiming there was “no room for morality” at that elevation. Mountain-climbing is frequently employed as a metaphor for many other things in life, and usually in a positive light. It involves the overcoming of obstacles, or even the attainment of grace, as in Martin Luther King’s final address, “I Have Been to the Mountaintop.” I’ve never climbed anything that requires any technical skill, but I can certainly identify with the thrill of racing up a large hill or mountain and standing astride its peak. It taps into some primal human instinct to conquer and lord over things, a drive that we never can get rid of, no matter how hard we may try. Actually climbing the world’s tallest mountain, however, is an utterly miserable experience. Everest’s summit, at 29,000 feet, is at roughly the same cruising altitude as an airplane. Simply getting to base camp requires a trek at altitude that is enough to cause health problems for many. Nothing grows on the mountain, save a few patches of moss; it is a heap of rock and ice, with glaciers shifting and office tower-size chunks falling unpredictably. The mountain is littered with garbage such as spent oxygen cans, though people have tried to clean it up in recent years. It is also littered with feces: the lodges along the trek to the mountain are absolutely putrid, often causing sickness that has nothing to do with thin air. And then there is the climb, with threats of severe altitude sickness along the way. Many people can only go a few steps without resting once they near the top, and no one can think half as clearly as they can at a lower elevation, even with bottled oxygen. Rescue attempts by helicopter are very dangerous undertakings; there is barely enough air for a chopper’s rotors to generate any lift, and the rescue of two severely frostbitten climbers from 20,000 feet in 1996 was, at the time, the highest rescue ever staged. Temperatures far below zero and near-constant hurricane-force winds make a mockery of this Minnesota winter that’s driven me under a blanket with a cup of tea. And yet the desire to climb Everest consumes people, even when they know the odds they face. Three of the four deaths in the Adventure Consultants party might be partly attributable to the drive of Doug Hansen, a man who had twice failed to summit Everest and would not stop, despite lagging severely due to several ailments. Hall, perhaps understanding that drive, ignored his own protocols and never tried to turn him around; junior guide Andy Harris, who was already dazed to the point of delirium after losing his oxygen supply, stayed high on the mountain to make an ill-advised rescue attempt. All three men perished when a storm pinned them to Everest’s highest ridges. Krakauer is meticulous in detailing everything that went wrong on the mountain, as best as he could from the oxygen-starved memories of his fellow climbers. Though he tried not to assign too much fault, his account rankled many people, including the family of the deceased guide Scott Fischer, who thought no one deserved to be blamed. Krakauer makes note of Hall’s criticism of the way Fischer handled his Sherpas (one of whom died of injuries sustained in an avalanche lower on the mountain earlier in the expedition), and also presumes Fischer was responsible for asking his most powerful Sherpa to practically tow Pittman up part of the mountain. (If successful in her climb, Pittman’s celebrity would have been a boon to Fischer’s business.) The Sherpa in question would otherwise have been laying rope at the head of the column, which could have spared the climbers several bottlenecks and conceivably gotten most, if not all, back to Camp Four by the time the storm hit. To be fair, Krakauer also notes that his own presence might have spurred Hall to push his team farther than he should, and also talks of his guilt over failing to notice Harris’s troubles and twice being wrong about his whereabouts. Perhaps the greatest controversy revolved around Anatoli Boukreev, a Kazakh guide for Mountain Madness who was arguably the most skilled climber on the upper reaches of the mountain that day. Boukreev, claims Krakauer, had a different concept of guiding from everyone else, summiting the mountain without oxygen and sparring with Fischer some over his relative inattention to clients. 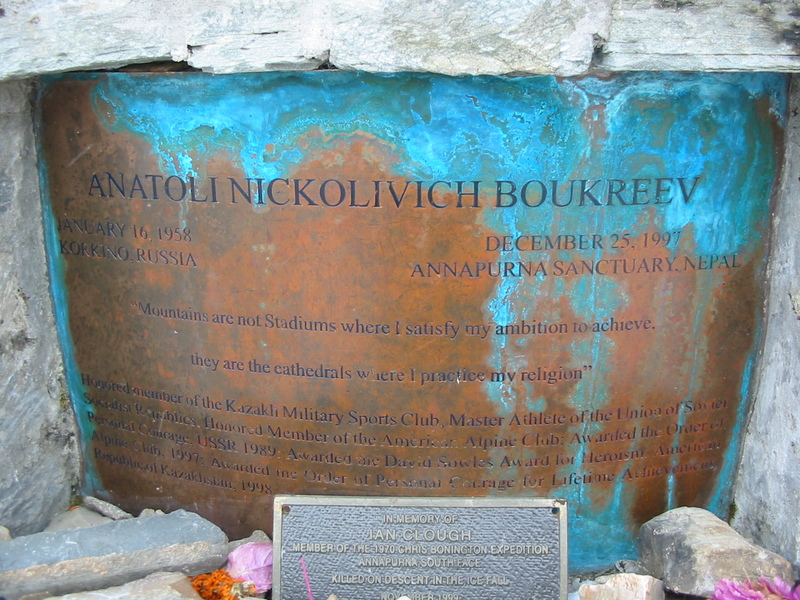 Still, Boukreev was strong enough to return to camp long before the others, and recharged before heading out on a rescue operation in which he saved two climbers’ lives. Fischer, who was probably very sick before the ascent, was the only person in the Mountain Madness party to die, whereas four Adventure Consultants team members died, and a fifth was left for dead before miraculously wandering back into camp. The upshot of all of this was the fact that the 1996 climbing season was, in fact, less deadly than the average up to that point. (The average has improved since then due to much higher traffic on the mountain, though the raw number of deaths on the mountain still hovers around 5.4 per year, including ten in each of the past two years.) The trash and the feces are not the most glaring things left behind on the slopes of Everest. Those would be the human bodies frozen in place all along the route up the mountain, a graveyard that only grows as the years pass. “Mountains are not stadiums where I practice my ambition to achieve. They are cathedrals where I practice my religion.” Lofty words, to be sure. But they also go to the root of that still-poorly-understood part of the human psyche that drives people to achieve great things; that part where our love for some thing or someone becomes a religious drive that gives life meaning. We need not all take it so literally, but we do need mountains to climb, and while we cannot remain at the top for long without running out of air, the moment of victory can last a lifetime. In the meantime, though, excuse me as I pull the blinds on these gale-force winds and massive waves on Lake Superior, and crawl a bit further under my blanket. The next book I read is going to be about an adventure in the Amazon or the Sahara or something.